For a high-tech company headquartered in Texas, onsite events happen all day every day across a large campus. Employees expect quick turnaround times and clean, properly set spaces for each meeting or special event. Face-to-face meetings contribute to the culture and as a result, the event technicians are busy all day long. That’s where Dorothy comes in. She’s the C&W Services technician who maintains the client’s event space. “We’re always walking the whole campus,” she says. 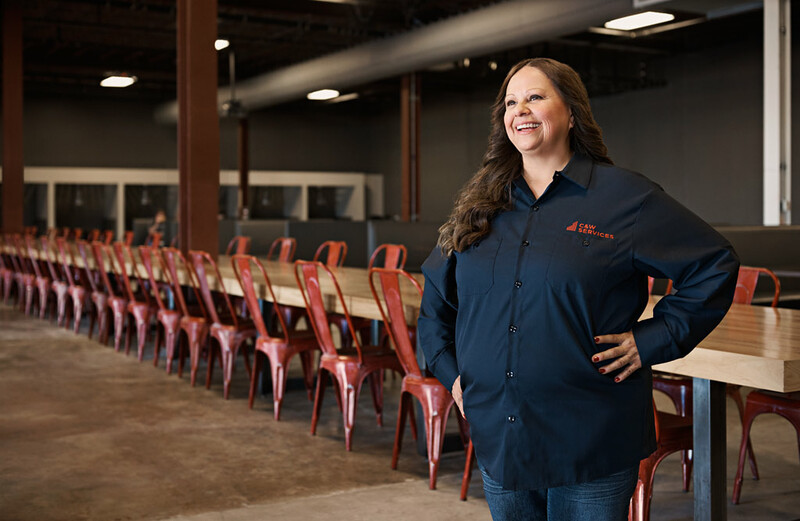 “That is what I do for eight hours.” Dorothy takes great pride in making sure spaces are prepped and ready, and that event hosts have everything they need to be successful. “I’ve been here for four years, but I just moved over to the events team from housekeeping so I could have some new career challenges. … My boss and I really bonded.” Having engaged, committed employees like Dorothy makes a critical difference in how our service is delivered. “I love this job,” she says. Committing to integrity at work. One day, after the client’s employees held a fundraiser for a seriously ill co-worker, donations that had been collected during a team event were lost. Unaware of the mishap, Dorothy found a large envelope of money during cleanup and immediately worked with security to get it back to its rightful owner. For her, turning in more than a paycheck’s worth of cash was second nature, and something she did without hesitation. Our clients benefit from having empowered, connected and culturally aligned frontline employees assisting with all their workplace delivery needs, ranging from janitorial, maintenance, critical environment management, landscaping and office services. C&W Services brings 65 years of experience to the facilities we maintain. From management to the front line, our site teams act with the highest degree of ingenuity, integrity and client-focus. Dorothy is one of many stories we have from the field that demonstrate how our team’s culture is the backbone of our service delivery success. Get inspired and read more stories about employees just like Dorothy.